The Spectrum Duo has been playing chamber music since the pair met as graduate students at Syracuse University over 20 years ago. 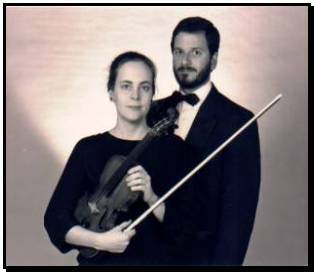 Since settling in Naperville in the late 1980's, they have performed chamber music for numerous weddings, receptions, parties and corporate gatherings in the Chicagoland area and beyond. In addition to offering services as a duo, they have also played extensively with the Spectrum Trio, which adds the talents of cellist Edward Moore. The Duo's programs feature a wide range of light classical selections, including music of Bach, Pachelbel, Haydn, Mozart, Beethoven, Schubert, Debussy and many others. Assistance in designing a program of selections appropriate to your occasion is provided upon request.